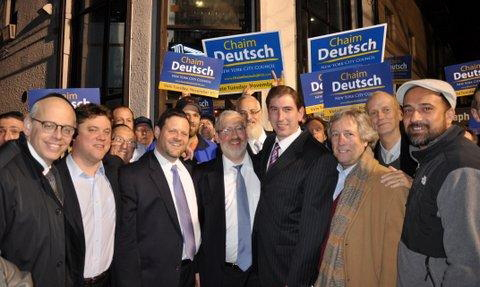 Shomrim founder Chaim Deutsch won decisively Tuesday to become Flatbush’s next councilman, taking his place as the second Orthodox lawmaker, a record never before reached. Deutsch, the Jewish liaison to the outgoing, term-limited Councilman Michael Nelson, defeated Republican David Storobin by a 55 to 39 percent margin. For his victory, Deutsch assembled a broad coalition of voters from the Orthodox, Chinese and Pakistani communities to counter the Russian vote that was expected to go to Storobin, a native of the former Soviet Union. The race for Deutsch’s seat actually began last year, when the redistricting commission reduced the Orthodox population in the district from nearly 50 percent to its current 30 percent. Over three series of hearings, Orthodox askanim argued that they wanted a second Orthodox-majority district to reflect their numbers. In the end, the district remained the way the commission assigned it, with some referring it as a “super Russian” district. In an upset, Deutsch ended up winning the Democratic primary over Ari Kagan, the establishment candidate, and won Tuesday easily over Storobin, a former state senator. This article appeared in print on page 22 of the November 7th, 2013 edition of Hamodia.